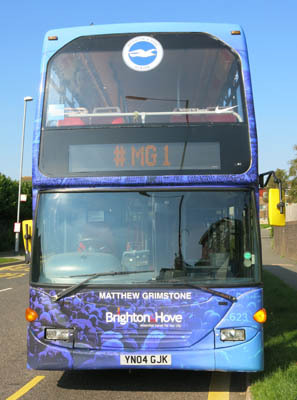 Connections with Brighton and Hove : Matthew Grimstone was born in Brighton on 31 October 1991. He attended Balfour infants and juniors before going onto Varndean School and College. He always had a passion for football, playing for school/college teams then local team Mile Oak FC where he helped the youth team win the league, going unbeaten and then with the reserve team win the Reserve Challenge Cup. 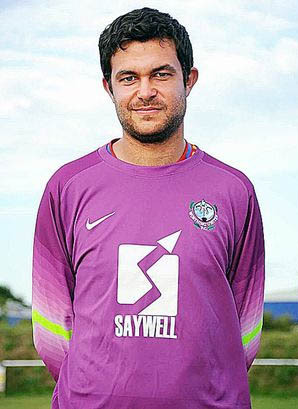 Matthew then moved on to Worthing United where in his first season the team won both the Division 2 League and the Division 2 Challenge Cup. Matthew worked as one of the groundsman for Brighton & Hove Albion, starting at the university training ground at Falmer before moving to the state of art ground at Lancing. Matthew was travelling to play a game at Worthing United alongside team mate Jacob Schilt when their car was hit by a Hawker Hunter plane on the A27 near Shoreham. The plane was perfomimg a stunt at the Shoreham Airshow on 22 August 2015. 11 people died in the tragic incident. 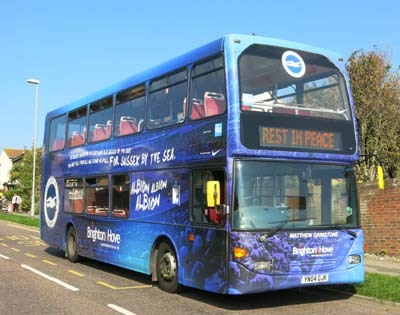 623 Scania Omnidekka - named in honour of Matthew Grimstone after the Shoreham Airshow disaster from October 2015.